On Friday, October 31, 2008 you can shake the dust off of your best Halloween costume. Get into the Halloween party mode and bring along one of our pumpkin arrangements to the celebration! They are a surefire way of creating a wonderful surprise. 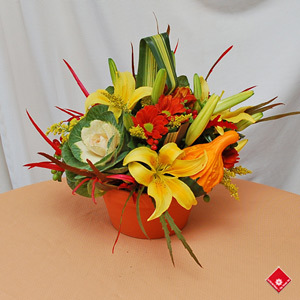 Our fall flower arrangements combine the freshest blooms and gourds of the season. The vibrant colors bring the beauty of the changing leaves inside your own Montreal home. Why not order one of our arrangement made with fresh Quebec apples? They combine the best of the season: warm-colored blooms and delicious fruit. The Flower Pot, your Montreal florist.